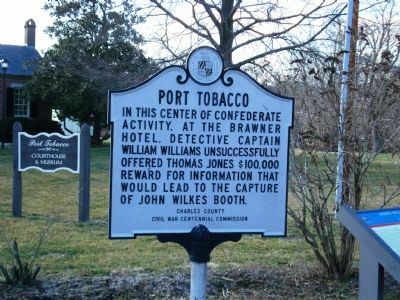 In this center of Confederate activity, at the Brawner Hotel, Detective Captain William Williams unsuccessfully offered Thomas Jones $100,000 reward for information that would lead to the capture of John Wilkes Booth. Erected by Charles County Civil War Centennial Commission. Location. 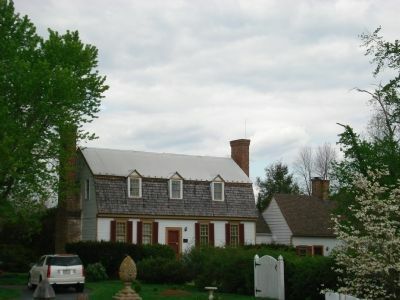 38° 30.671′ N, 77° 1.195′ W. Marker is in Port Tobacco, Maryland, in Charles County. 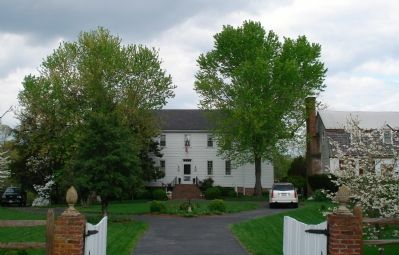 Marker is on Chapel Point Road. Touch for map. 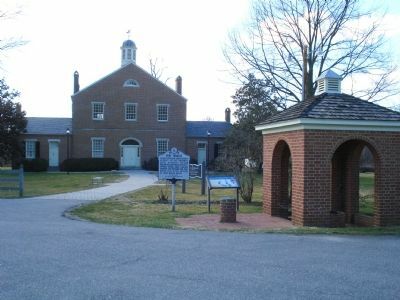 Marker is located at the entrance to the Port Tobacco Court House Historic Site on the edge of the parking lot near the old well. 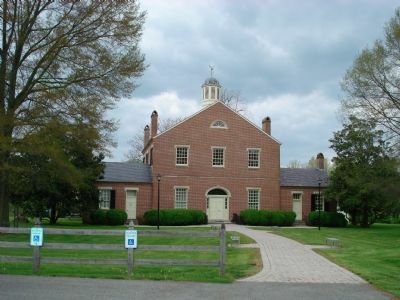 Marker is in this post office area: Port Tobacco MD 20677, United States of America. Touch for directions. of this marker); Port Tobacco Jail (about 400 feet away, measured in a direct line); a different marker also named Port Tobacco (approx. 0.3 miles away); Daniel of St. Thomas Jenifer (approx. 0.9 miles away). Touch for a list and map of all markers in Port Tobacco. Regarding Port Tobacco. The offer of 100 thousand dollars was quite significant for the time. Adjusted for inflation, it would be the equivalent of more than 1.2 million in today’s dollars. 4. Is this the Brawner Hotel? 5. Or is this the Brawner Hotel? More. Search the internet for Port Tobacco. Credits. This page was last revised on January 19, 2019. This page originally submitted on May 13, 2007, by Roger Dean Meyer of Yankton, South Dakota. This page has been viewed 2,921 times since then and 27 times this year. Last updated on January 17, 2019, by David Lassman of Waldorf, Maryland. Photos: 1, 2, 3. submitted on May 13, 2007, by Roger Dean Meyer of Yankton, South Dakota. 4, 5. submitted on June 3, 2007, by Roger Dean Meyer of Yankton, South Dakota. • Bill Pfingsten was the editor who published this page.